The Lyretail Guppy or Poecilia reticulata is arguably one of the best starter freshwater fish for a small aquarium. 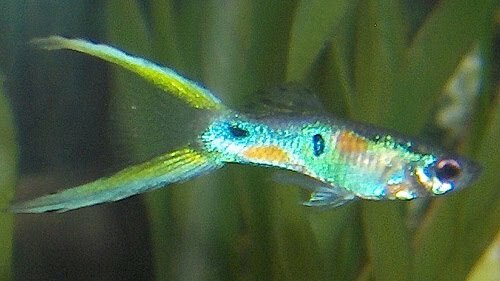 These Guppies are not only hardy and easy to care for, but they are very colorful too! They only requiring an aquarium of about 20 gallons or more with the following water conditions, 64-82° F, KH 10-30 and pH 5.5-8.0. A combination of algae based foods with meaty foods well keep these omnivores happy and healthy. Brine Shrimp, Tubifex, Bloodworms and flake food will all work well for the Lyretail Guppy. Hello! Thank you for the info. I have been keeping guppy for many years but never tried this species.